Trigeminal neuralgia, a painful condition of the face, is characterized by stereotypic symptoms and (absence of) signs that usually allow its clinical diagnosis. The average age of onset is around 50 years. 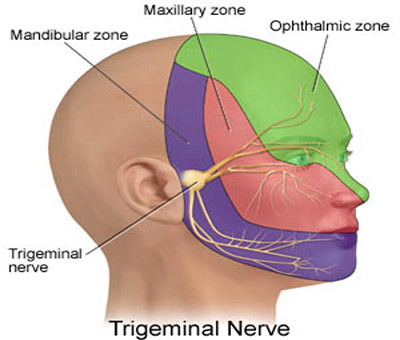 Pain is in the distribution of one or more divisions of the trigeminal nerve and is labeled as V1, V2 or V3 neuralgia. The pain is lancinating and described as “shock like”, “bolt out of the blue”, “shooting pain” etc. It is brief in duration, lasting for few seconds to couple of minutes. In a typical trigeminal neuralgia, the patient is pain free between the attacks. The pain is precipitated by triggers. These include simple actions like brushing the teeth, washing face, mere touch or even a breeze of air. During the acute attacks, the pain is severe enough to compromise hygiene or diet. In some patients the pain is so excruciating that they start considering the idea of suicide. In a typical case of TN, the disease is characterized by remissions with or without medical treatment. The period of remission is variable and after a few years of disease the remissions do not occur. Patients with TN should not have neurological deficits, and if such is present a CT scan or MRI should be carried out to rule out other pathology. CT/MRI should also be performed if the pain is atypical. 1% of patients with multiple sclerosis (MS) develop trigeminal neuralgia and 3% of TN patients suffer from MS. In patients suffering from TN there is extreme hypermyelination, demyelination, and tortuousity of hypertrophied axons. Kerr observed that the myelin disintegration is far more pronounced in the patients with trigeminal neuralgia than normal patients. These changes are noted at the level of peripheral branches of trigeminal nerve, gasserian ganglion, and trigeminal rootlets and also in descending spinal trigeminal tract. Though the cause of this is not known vascular compression of the trigeminal rootlets by either artery or veins at the level of the root entry zone is put forward as one of the cause. In patients with typical TN, radiological investigations are not necessary. However, when performed, MRI (Cis images) may reveal vascular loop adjacent to the trigeminal nerve root entry zone on the affected side. However, this is not a diagnostic finding for TN, as in many cases patients suffer from TN even in the absence of the vascular loop. In patients desirous of undergoing Microvascular decompression, demonstration of the loop increases the chance of success.